We know that the wait for issue #2 has been long. In the meantime, we present Graceless #1.5 with new articles and reviews of current releases from No Red Seas, Haus Arfana, ohGr, Branes, March Violets, Monica Richards, Primary Colors and Skinny Puppy, and cover art from Beatrice Schleyer. 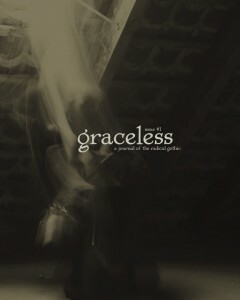 Download a PDF of Graceless 1.5 here. 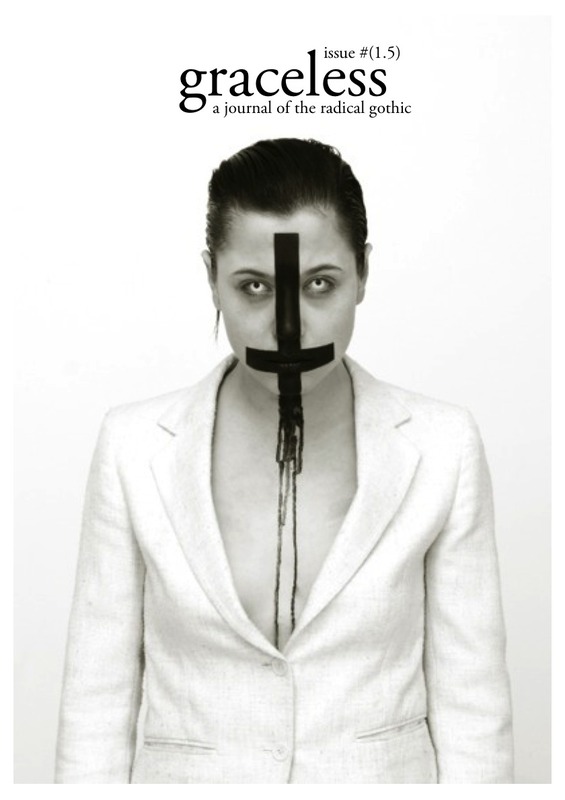 Upcoming material in Graceless Issue #2 includes interviews with Primary Colors, Monica Richards, Nomadic War Machine, Bestial Mouths and Belltower Bats, and Darkrad as well as a review of the Laibach and Neue Slovenische Kunst activities in London 2012. We also have contributions covering “Art from Madness”, “Real Life Vampires” (we’re serious! ), “Tarot for Goths”, another installment of correspondence between Prof. Fether and Isis, more photography from Beatrice Schleyer, and coverage of recent actions by radical goths. After a busy summer and fall of adventure and radical activity and then a long winter’s nap, we are currently going into production of Issue #2 of Graceless. Any contributors still needing to provide us with art work or photos, please send that in immediately. We’ve moved to a different model with publishing the magazine: we will accept contributions continuously and release the journal roughly once a year, perhaps slightly more often. We’ve already got a ton of great content for #2 and we’re very excited about it. So feel free to contribute! The magazine is starting to filter out to other distributors, and the first issue of Graceless can now be purchased from Amazon.com. And also from Amazon.co.uk. It’s with great joy that we announce the premiere issue of Graceless, 117 pages of articles, interviews, and photography. Discover bold new manifestos, read of our predecessors and help us ponder what greatness the dark scene might aspire to in the future. At the moment, it can be purchased for $6 from Createspace, the printer. It will shortly be available from Amazon and smaller distributors and stores as well. It can be downloaded for free in either print resolution (300dpi, over 100mb) or web resolution (72dpi, about 10mb). Mayday will be the last day that we will accept contributions for issue #2. Deadline for issue #1 has passed. Now accepting work for issue #2. Well, January first has come and gone, so any new submissions will now be considered for issue #2. Issue #1 is coming along beautifully and should be printed by the end of this month. No deadline has been set for #2 as yet. Firm deadline for issue #1 – January 1st. Alright, we’re almost done, after waaay too long, with the first issue of Graceless. The firm deadline for inclusion in the first issue is January 1st. If you’ve got articles, interviews, suggestions, art, or anything like that, get it to us by then! The first issue of Graceless is coming along beautifully. We’ve already got some excellent, insightful interviews and articles, and we’re starting to hear from more and more people. I personally hope that we’ll get the first issue out by the new year, but I have to admit that, what with the time-lag of getting things to and from a printer, it isn’t incredibly likely. Sometime in January is more realistic, but we’ll certainly continue to try. One problem that we’re running into is that we’re not skimping on content at all: it will most likely be 108 pages of content, no ads. Graceless will be a printed, perfect-bound journal exploring the radical elements of gothic culture and aesthetic. editor on Deadline for issue #1 has passed. Now accepting work for issue #2.